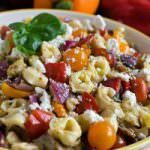 This Tortellini Salad with Roasted Vegetables has been one of my go-to recipes for a long time! 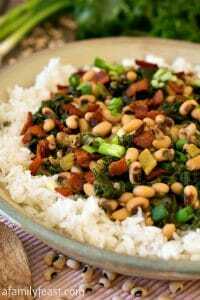 I’ve been making it for at least a decade – and it always gets rave reviews from anyone who eats it! We start out by roasting a mix of cubed eggplant, red and orange bell peppers, red onion and garlic in the oven with olive oil, salt and pepper. While the vegetables are roasting, cook some tortellini, and also mix up a simple but flavorful dressing made with Dijon mustard, champagne vinegar, extra virgin olive oil and salt and pepper. 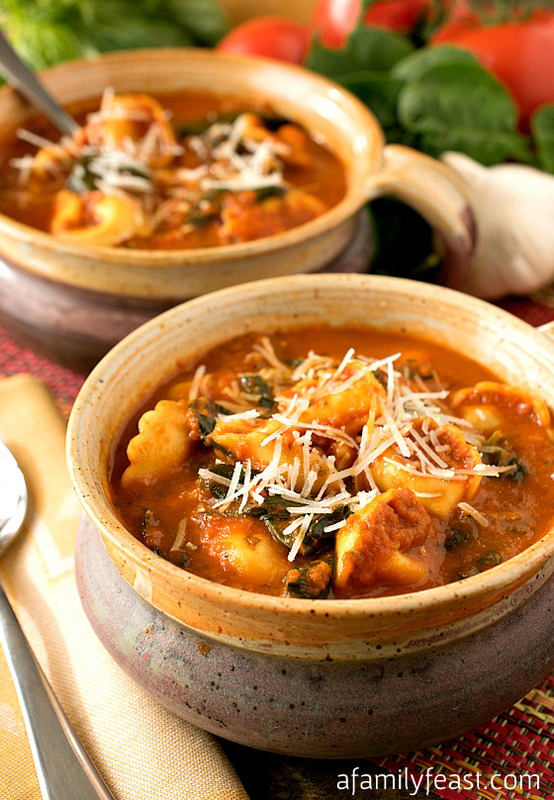 Once the vegetables and tortellini are done, mix everything together in a large bowl – ideally while the tortellini is still warm so that the pasta absorbs all of the wonderful juices and flavors from the roasted vegetables as it cools. 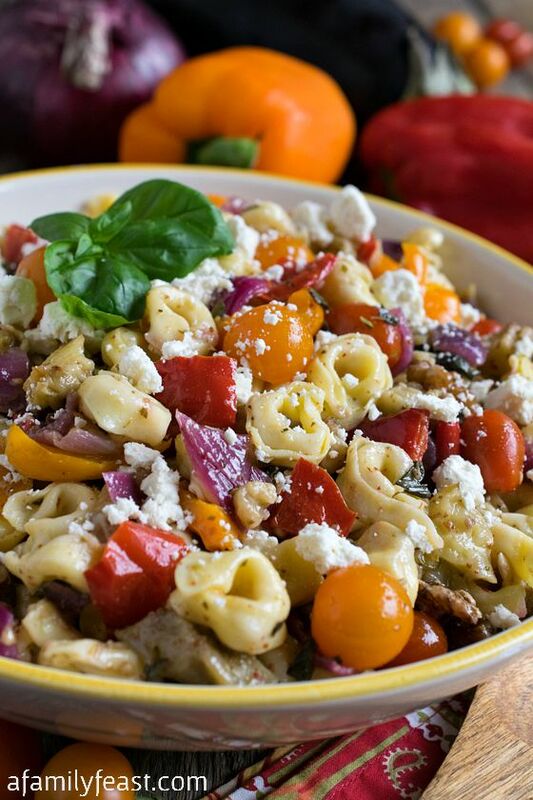 Right before serving, sprinkle some crumbled feta cheese over the top of this delicious Tortellini Salad with Roasted Vegetables – and enjoy! In a large bowl toss eggplant, red and orange peppers, onion, garlic, oregano, salt, pepper and olive oil. Pour out onto a sheet pan and roast for 15 minutes. Flip vegetables and roast for 15 minutes more. Cook the tortellini according to package directions – but time it so the pasta is ready at the same time the vegetables come out of the oven. Drain pasta well. While vegetables are roasting, make dressing by combining mustard, vinegar, salt and pepper. While whisking, slowly pour in oil to make the vinaigrette. Set aside. 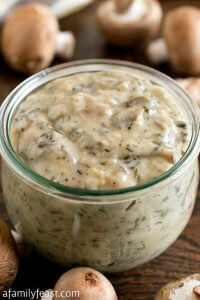 Once the vegetables and drained pasta are ready, place in a large bowl with the dressing and gently toss. Toast walnut pieces in a dry pan for about five minutes to brown. 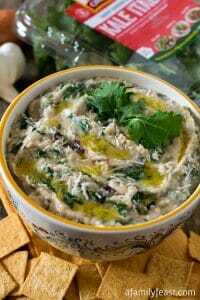 Add to large bowl along with fresh tomatoes and basil. Toss again. At this point you can chill the mixture on a flat pan to cool quickly and when ready to serve, place in a bowl and add the feta cheese or if serving warm, sprinkle feta over the top and serve. Totally craving all of the veggies in this pasta salad! The colors are beautiful too! This is one of those go to perfect summertime meals. 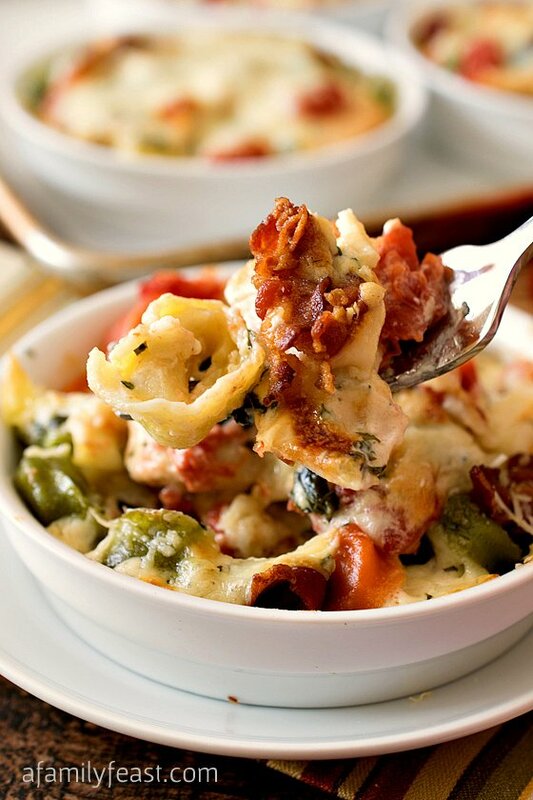 Who doesn’t love lots of roasted vegetables paired with quick cooking tortellini? Roasted is the only way to go when it comes to eating veggies for me. I’m so picky! 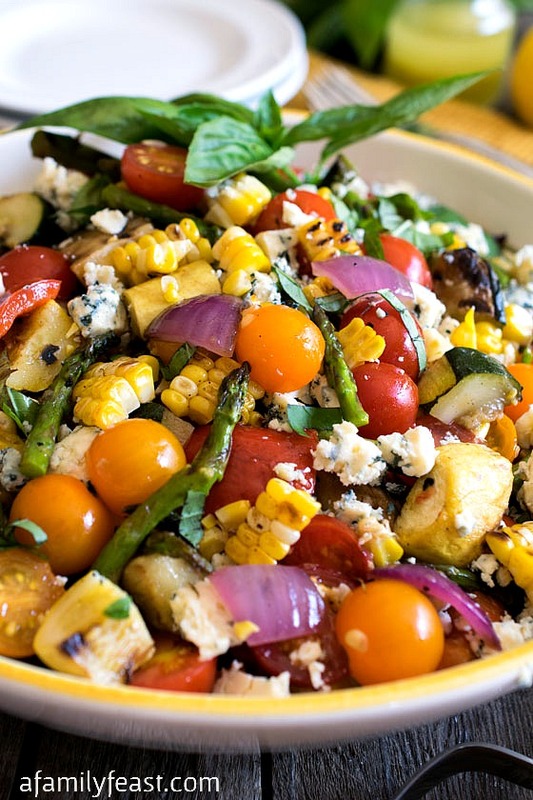 Love this salad – it’s perfection. This is taking tortellini salad to a whole new level! 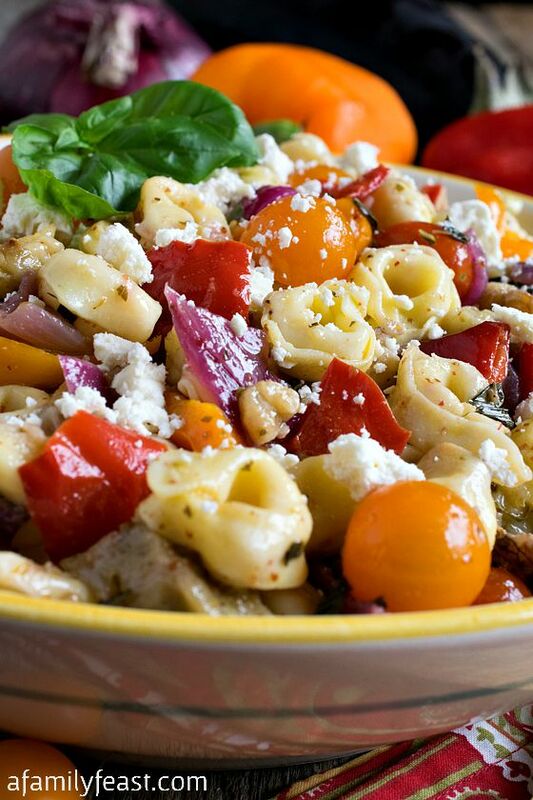 I love roasted veggies, then combined with the tortellini, that delicious dressing, and a topping of feta…wow! How delicious. This is the kind of thing I could eat every single day!